On the eve of a massive teacher rally that’s expected to draw up to 15,000 North Carolina educators to Raleigh, the state’s most powerful legislative Republicans said Tuesday that they’ve agreed to at least a 6.2 percent salary increase for teachers this year. 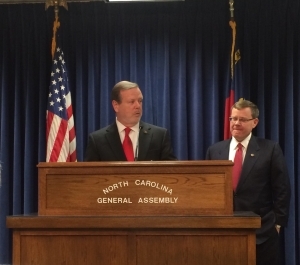 “We believe that growth is what matters most,” N.C. House Speaker Tim Moore, R-Cleveland, told reporters Tuesday. However, a spokeswoman for Gov. Roy Cooper’s office pointed out Tuesday’s GOP announcement was nothing new, noting last year’s approved spending package had already included plans for the teacher raise. A budget plan announced last week by the Democratic governor included calls for an average 8 percent raise for teachers, in which no teachers would receive less than a 5 percent raise. The plan would help North Carolina reach the national average in teacher pay in four years, his office said, making up the additional funding by axing GOP-approved tax cuts for corporations and high earners. Lawmakers have been criticized for approving billions in tax cuts while public school funds eroded. When asked Wednesday, Berger said Republicans have “no intention” of raising taxes this year. As Wednesday’s march approaches, North Carolina Republicans have been emphasizing raises approved by state lawmakers in recent years, raises that lifted the state from near the bottom of the nation in teacher pay to 39th this year. Moore and Berger mostly pointed to Democrats for the state’s dismal teacher pay, calling out teacher furloughs and salary freezes imposed shortly after a nationwide recession sank state revenues in 2008. Berger also blamed “politically motivated rhetoric and misinformation” for criticism of lawmakers’ public school decisions. However, a nonpartisan report this year from the National Education Association (NEA) calculated that teacher pay plunged more than 9 percent when adjusted for inflation from 2009 to 2018, the lion’s share of that time spent under dominant Republican majorities. Also, another report noted the state’s overall education funding per student saw one of the largest decreases in the nation from 2008 through 2015, most of that time spent under Republican majorities. The timing of Tuesday’s announcement—one day before a large-scale teacher protest timed to coincide with lawmakers’ return to session—will likely be seen as an effort to undercut protesting teachers. Educators say they will focus on a host of public education issues Wednesday—including overall school funding, classroom supplies, infrastructure, and, of course, teacher pay. “These are the facts: tomorrow tens of thousands of educators from across our state will be at the capital because they demand better for our students,” said NCAE President Mark Jewell in a statement. Berger and Moore said they’ve set aside time Wednesday to meet with teachers from their districts, although they did not provide more details for reporters Tuesday. In recent days, the Republican legislators accused education leaders of using “union” tactics to galvanize teachers into Wednesday’s march and rally. Teachers aren’t allowed to collectively bargain or strike under state law, although organizers with the N.C. Association of Educators (NCAE) describe Wednesday’s protest as a one-day rally, with a focus on the November legislative elections. Berger’s referring to the closure of a reported 41 North Carolina school districts—serving the majority of North Carolina’s 1.5 million schoolchildren—in anticipation of large-scale teacher absences Wednesday, a point that has spurred some criticism from top Republicans. Berger also downplayed teacher interest in Wednesday’s protests, adding that he does not believe a majority of the promised rally-goers would actually attend. Legislative leaders and their surrogates are emphasizing that this year’s pay increase would mark the fifth consecutive set of teacher raises. Yet North Carolina teacher pay—which averages out just above $50,000, including local supplements and benefits— remains nearly $10,000 below the national average and ranks 39th in the nation. Meanwhile, North Carolina’s overall per-pupil funding—about $9,500 per student—also lags the national average of about $12,000. It ranks 39th in the nation, according to the NEA report. Tuesday’s legislative announcement lacked details about the teacher pay schedule, which has been oft-criticized by educators for its various plateaus. Teachers have also slammed lawmakers for bypassing raises for the state’s most experienced educators. North Carolina teachers say this week’s march and rally were inspired by similar protests in other conservative-dominated states like West Virginia, Oklahoma, Kentucky and Arizona—walkouts that, in some cases, spurred action from state lawmakers. 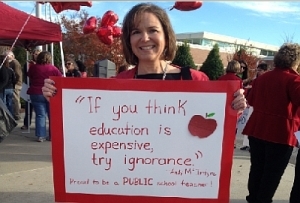 Wednesday’s schedule is expected to include a 10 a.m. teacher march from the NCAE’s Raleigh headquarters to the General Assembly building on Jones Street. Some teachers are expected to begin filing into the legislature after the march. The House and Senate will convene at noon. The NCAE says they’ll wrap the day with a 3:30 p.m. rally, rain or shine, at the Bicentennial Mall across from the legislative building. Look for Policy Watch coverage throughout the day Wednesday. Here we go again. That 6% percent will go to the younger teachers. veteran teachers with 25 years and up won’t even get half of that if we are lucky. Salary still flat lining. How is this not considered age discrimination is beyond me! Where are the advocates for us? Prime example of ignorance. It’s not all about teacher pay, especially that measly 6% It’s about students. Outdated/not enough text books, not enough emotional support for students, overcrowded class rooms, computers and printers not working, commodes leaking and not flushing, kids with no lunch money or field trip money that the teachers fund. No supplies, like glue, pencils, paper, backpacks, rulers, binders, notebooks, erasers, scissors, markers, highlighters, sticky notes, hand cleaner, the list goes on. Who pays for all of this you ask? THE TEACHERS!!!! Vote these in Raliegh out and see if the next bunch can do better By the way, we need proctors for all of the unnecessary testing in two weeks Are you free?